The Central Illinois Toy Show in Bloomington, Illinois was a first for me. After trying out a new place to eat Abe’s Café in Springfield, we meandered north and headed for the Holiday Inn near the airport to see what the show had to offer. 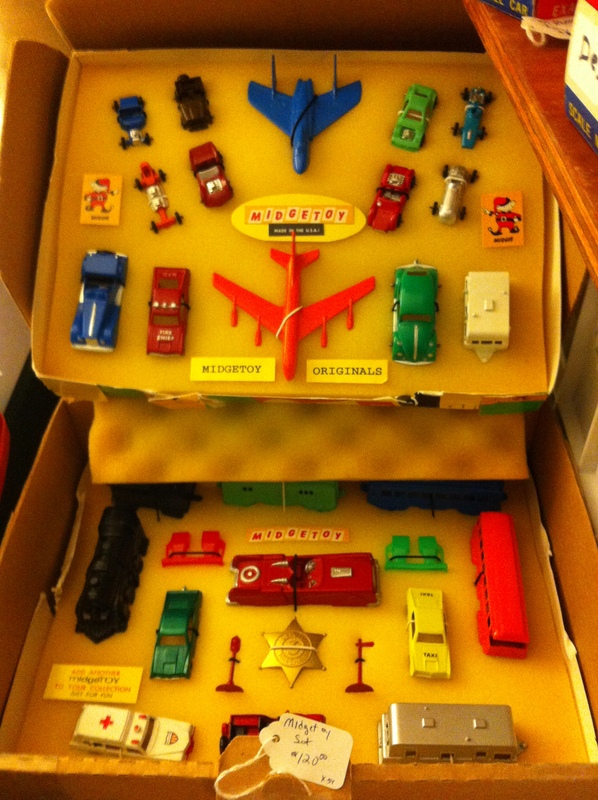 The brothers were Alvin and Earl Herdklotz and they started making precision tooling, and then after World War II began to produce die cast toy vehicles and airplanes. Rueben had a sample collection of toys they produced in a box set along with a rare military sample of toys as well. The show also offered a cool corn history lesson from John Galaway of Farmer City, Illinois who offered insight into corn husking. His display included a collection of corn hooks used to remove the corn from the husk before technology came along. This past August at the Half Century of Progress I was able to talk to some world class corn shuckers and I saw the amount of work that those corn hooks did. All in all, it was a great day with the hubby riding down I-55 and taking in the sights and spending time together on this Thanksgiving weekend.